Recently I have started searching for free web scraping software. I have Google about it and I have come across some Google Chrome browser extensions for web scraping. First I am landed at Screen Scraper extension page in Chrome Web Store. I have started testing it by taking Yellow Pages website as a target website. After exploring it by hard, later I come to know that it can scrape data from only one page. Disappointed! Again I started searching for it; I have found another extension known as Scraper. One more time, I disappointed after knowing that it cannot scrape data from multiple web pages at a time. Finally I found a nice web scraping extension on Google Chrome store named Web Scraper. Web Scraper is a chrome browser extension built for data extraction from web pages. It can extract data from multiple pages. Using this extension you can create a plan (sitemap) that specifies how a web site should be traversed and what should be extracted. Using these sitemaps the Web Scraper will navigate the site accordingly and extract required data. Scraped data later can be exported as CSV (Comma Separated Values). Let’s explore the extension in detail with example. Suppose we want to extract data from Yellow Pages. Let’s open the Yellow Pages from which we want to collect leads. In Web Scraper, sitemap is plan or traversal map to collect data from the website. Click the “Create new sitemap” option. The first thing one need to do while creating a sitemap is specifying the sitemap name and starting website URL. If website is using numbering in page URL then it is easy to specify number range in URL than creating navigational link selector to navigate to a next page. The above example scrapes first five web pages of the website. 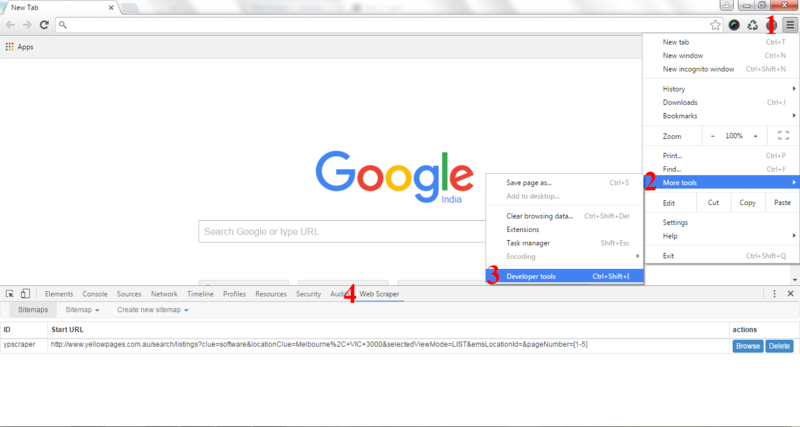 After specifying sitemap name and start URL, click save sitemap button. Then you will be shown selectors screen. Selectors as it name suggests, are html elements that contain data and links to navigate. First, determine which HTML element will be the parent element. Selectors are based on CSS Selectors. You can manually set Selector while creating it. A parent element is the smallest HTML element that contains all the data items we want to collect (in our case it is the element containing all the listing item(data row) details like business name, phone, email, website etc). With the help of Google Chrome Developer Tools (Ctrl+Shift+I), we can easily determine parent element. For this field to get scrape, we need to create a child selector of type Text and then select the element. Using “export data as CSV”, we can download extracted data as CSV file. We can also export sitemap and then later import it. If the result is fulfilling your requirements, you can download the above created sitemap here. After downloading the sitemap, Import it into the Web Scraper extension, and start scraping. Website which requires input for searching cannot be scraped. No support for Captchas and Proxies. Data cannot be exported to other file formats like XML, Excel etc. Less control over web scraping job. I hope the article is clear enough and well documented. But if still any clarifications needed, don’t hesitate to write in comments. I will be happy to help you.